The Council of Friends of Cathedral Music has approved a choral endowment grant for the music at St George’s of £25,000. The cheque was presented in the Dean’s Cloister after Evensong on 28 June. The Dean and Canons of Windsor are very grateful for this generous gift. 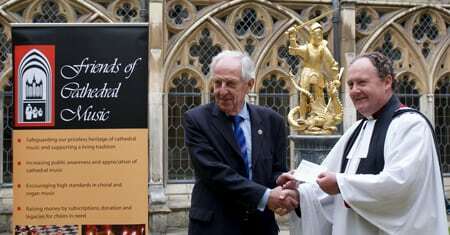 The Chairman of the Friends of Cathedral Music, Professor Peter Toyne, is seen handing over the cheque to Canon James Woodward in front of the St George and the Dragon fountain. For more information about music at St George’s please see click here. Friends of Cathedral Music is a charity founded nearly 60 years ago to safeguard and support cathedral, choral and organ music. Since the charity’s foundation over £2 million has been given to Anglican and Roman Catholic cathedral, church and collegiate chapel choirs. The photograph above shows Mr Richard Pinel (Assistant Director of Music), Professor Peter Toyne, Canon James Woodward, Mr Brian Henry (FCM) and Mr James Vivan (Director of Music).